Leader Khadka’s demise irreparable loss to country politics: NC President Deuba - Integration Through Media ....! KATHMANDU: Nepali Congress President and former Prime Minister Sher Bahadur Deuba has said the death of NC leader Khum Bahadur Khadka was an irreparable loss to the country politics. 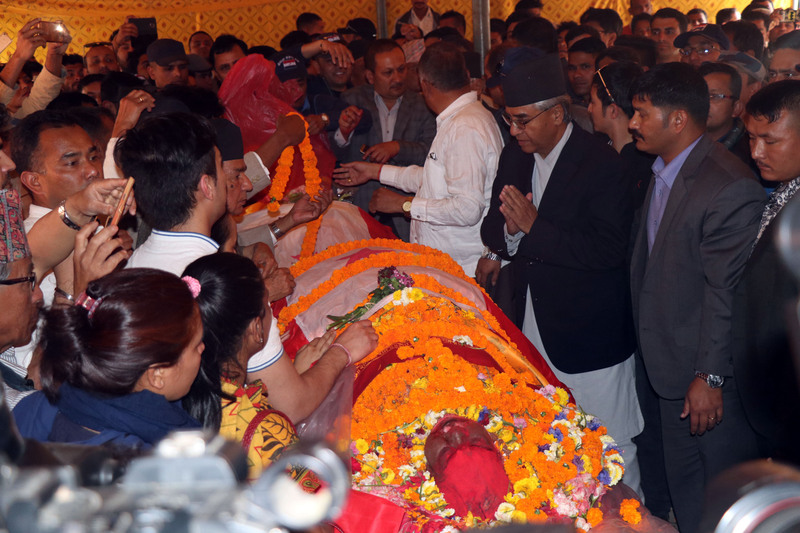 Paying tribute to the late Khadka, President Deuba reiterated that Khadka’s untimely demise was the loss not only to the party but to the entire country’s politics. “Khadka was a democracy stalwart. He spent his life for the cause of democracy” he added, wishing eternal peace to the departed soul and extending condolences to the bereaved family members. NC central member and former minister Khadka had died in course of treatment at Apolo Hospital of India last Friday. Khadka, 67, was suffering from kidney disease for long. His dead body brought from India was kept at Party Office, Sanepa, for two hours to pay tribute. On the occasion, senior leader Ramchandra Poudel observed that Khadka was a strong pillar of NC and fighter for Nepal’s democracy movements. Absence of leader Khadka will be felt forever in the party, he added. Another central member and former minister Mohan Bahadur Basnet said Khadka had joined NC politics very early and lived a struggling life for party’s democracy. At the party office, leaders of various parties as Subash Nembang, Janardan Sharma, Kamal Thapa and hundreds of NC cadres paid tribute to the late leader Khadka with floral offer. Earlier, Speaker Krishna Bahadur Mahara had reached Khadka’s residence to pay tribute. Expressing sorrow over the demise of leader Khadka, the Nepali Congress has decided to lower the party’s flag half for seven days in the party offices at all levels and keep the condolence notebook for 13 days. Earlier today, the emergency central working committee meeting of the party passed a condolence motion on the demise of central committee member Khadka. The NC would close all its offices including the central office, offices of the sister organizations and liaison offices abroad from April 1 to 3. Party’s chief secretary Krishna Prasad Poudel said that the meeting decided to postpone the entire party programmes except the condolence meets. Khadka, who joined politics with the inspiration of BP Koirala, had stayed in exile for long. The NC has concluded that the party and the nation has incurred an irreparable loss with the demise of Khadka. Likewise, NC has expressed high respect towards Khadka’s dedication to nationality, democracy and unflinching faith on socialism.